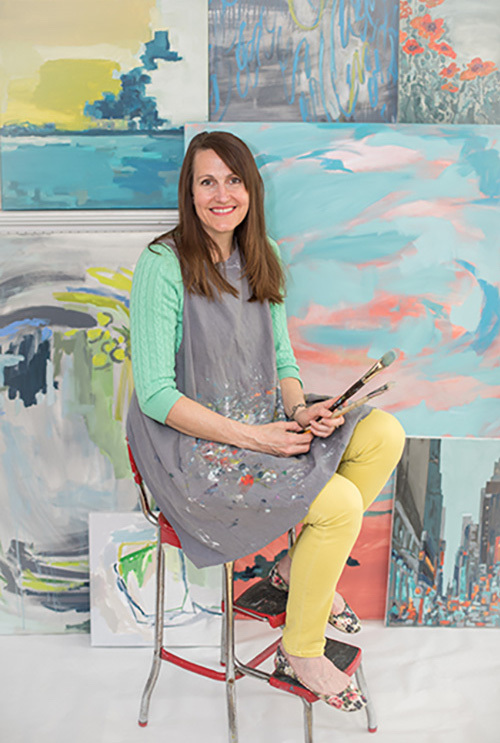 Award-winning artist Julia Bringhurst Blake has an impressive ability to work across many styles from abstract to figure. Inspired by everyday life she tends to use vivid colors, high contrast, bold strokes and metaphor to create aesthetic and meaningful works. As an artist she was a peer- and client-nominated finalist for 40 Women to Watch Over Forty. She has trained privately and at the MFA in Boston. She is currently enrolled in the Drawing and Painting Studies program at RISD. Her art is in private collections in over 25 states from Hawaii to Massachusetts as well as Europe, Asia and the Middle East. She lives in the Boston area with her husband and 6 children in a charming cape she renovated. Thank you to TCAN Center for the Arts for conducting the following interview. You work in abstracts to portraits, landscapes and still life — such a diverse range of subjects. Is there a thread, theme, or aspect of your work that is carried throughout? The common thread is often color and symbol. I typically like to paint about renewal, hope, redemption and how they play out in the human experience as taught by nature. This can be in the rhythm of waves or tides. It can be in the seasons or perennials. Or in the open possibility of clouds and space. I paint because I can - not because I have to. I don't want to paint myself into any corners and limit myself to certain genres or subjects. I paint as therapy too. Being married is tough. Being a mother is tough. So is being a good friend and sister and citizen. Often I work through struggles and triumphs at my sketchbook and easel. It's a great life! I hope my paintings show my gratitude for the amazing blessings that are mine and help people see the good in their own lives. You returned to painting after several years away from the easel. What motivated you to return to being an artist? What has been the biggest joy? My first love is being a mother. I LOVED being pregnant and having newborns and toddlers. I never wanted anything to get in the way of my time with those little people because they grow up so fast! When my youngest went to preschool I needed something fulfilling for that time. I really didn't think anything could compensate for the end of those new baby years until I started painting. I hadn't painted in over 20 years. But now that my career as a professional artist has taken off I am constantly having to reign in the painting and the business to finish the job I started of raising these kids. There are so many great things competing for my time and energies. I am seeking a balance and enjoying the journey. In addition to being an accomplished artist, you are also a mother. Are your children interested in the arts, visual or otherwise? How do you think being an artist and having the arts in their lives has influenced them? All of my kids play the piano. It's a requirement for being my child. Some days they like it and some days they don't, but it's not negotiable because it's a skill I want them to develop. I have two of my kids who are interested in visual arts. My third child and only daughter started taking art classes in 1st or 2nd grade from Natick artist Teresa Higgins. She learned so much from Teresa. That was at a time when I wasn't painting at all so I wasn't doing anything but encouraging her and driving her to class. She's 16 now and has been chosen for the Intensive (advanced) art class at school these last two years. Her natural ability and her technical aptitude are quite remarkable. I really hope she will go to art school after high school. My six year old son shows quite a lot of promise as well. He really enjoys drawing and painting and at times we'll work side by side. He's benefiting from having a studio and endless art supplies at his finger tips.